These Sea Salt & Olive Oil Roasted Turnips are an easy and simple turnip recipe, perfect for those busy cold fall and winter nights when you don’t have a lot of time for a fussy recipe! First, the vegetable that I am actually using is technically called a rutabaga. Turnips are white fleshed with purple skin and the rutabaga are brown/purple on the outside, yellow inside, larger and sweeter than turnips are. However, it’s common to call both turnips. Turnips can be bitter as well compared to the rutabaga, so most people eat rutabaga instead and call them turnips. Am I the only one who always forgets about turnips? I honestly walk by them in the grocery store about every 19 trips out of 20, then all of a sudden I have this immense craving for them. Perhaps it’s because it’s fall, perhaps it’s because it’s chilly, but I was craving turnips again the other day while grocery shopping. I brought one home where of course, it sat for a few days. I then panicked, like I usually do, and rushed to use it up the other night. I wanted to try something a little nicer than steaming it – which is my usual method- and decided to take the time to chop the turnip up all nicely and then roast it. You need to peel the turnips before you cook them. The skin is very tough and doesn’t cook up well. 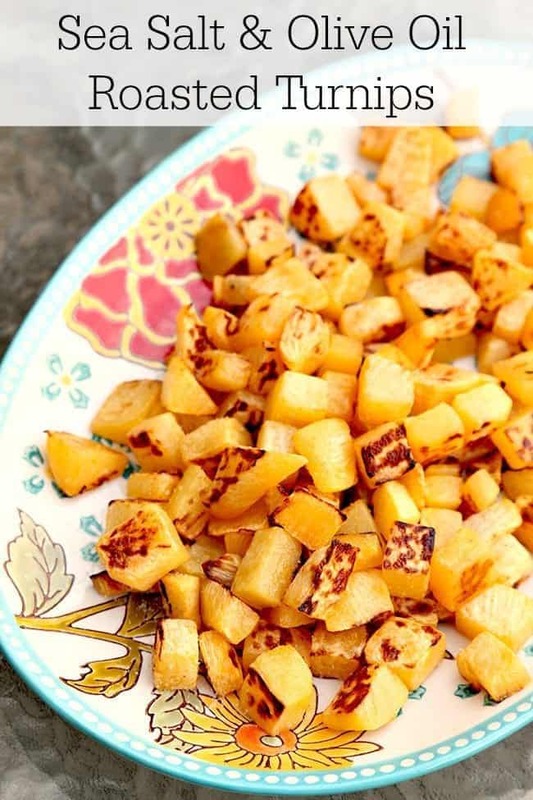 The best way to cook turnips is to roast them like this recipe. Our mom’s used to boil them like potatoes, and while I do enjoy them that way, roasting turnips bring out the sweetness of this root vegetables and gives it a great flavour. My Dad has been known to eat these raw, but I prefer to cook them. You can eat them raw if desired. 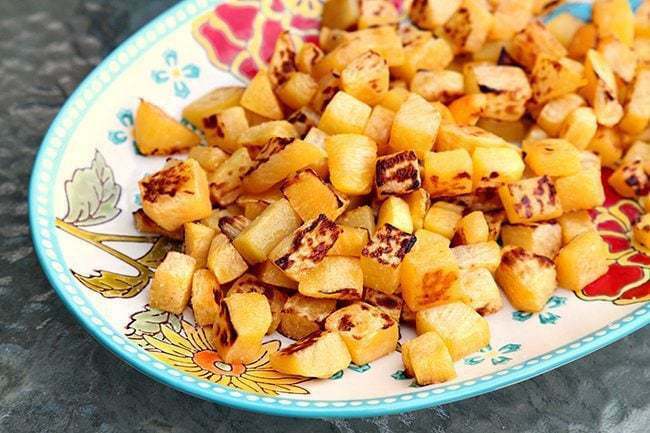 You can pair turnips/rutabaga with brown sugar to enhance the sweetness and any spice that goes well with sweeter root vegetables, like ginger, cinnamon or allspice. Red pepper flakes are also good with turnip! These turnips aren’t fancy, they aren’t all jazzed up with crazy flavors, they are simple, delicious turnips. They’re easy and fast to make. They’re also what needs to be on your plate for dinner this fall! PIN this recipe to your VEGETABLE SIDE DISHES board and remember to FOLLOW ME ON PINTEREST! Delicious roasted turnips with sea salt and olive oil. Peel and cut the turnip into half inch cubes. Toss with salt and olive oil. Place on a large baking sheet in a single layer and roast for 25-30 minutes, until fork tender. The sea salt is what makes these so good! Or toss with roasted walnut oil and some cubed pancetta to bring things to the next level. My husband HATES turnips..lol..but this actually “might” convert him! Well, if not, you can have it all lol!! 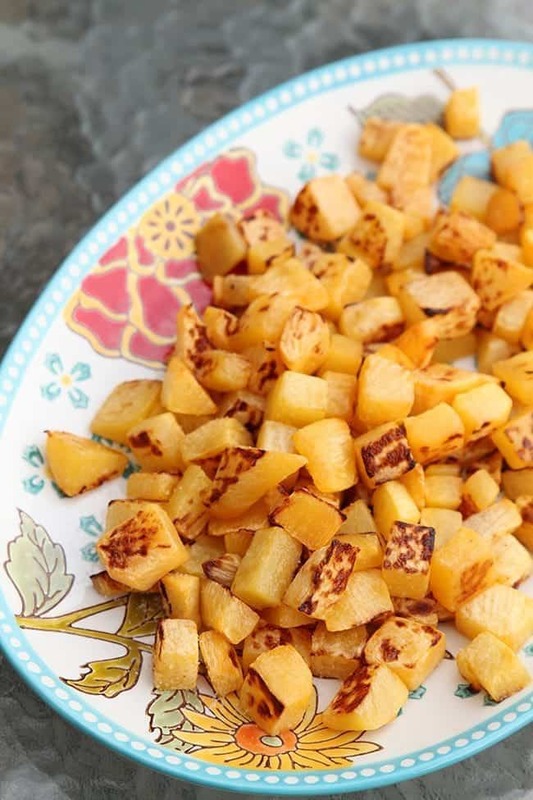 Where on your site do I find the method/recipe for the roasted turnip? Ladb It’s on the page right above your comment asking for it.